Her colleagues have quit or been killed. The last remaining police officer in the town of Guadalupe was kidnapped by gunmen on Monday and has not been seen. The lone police officer in the Mexican border village of Guadalupe remained missing on Tuesday, five days after reportedly being abducted by gunmen who stormed her home. 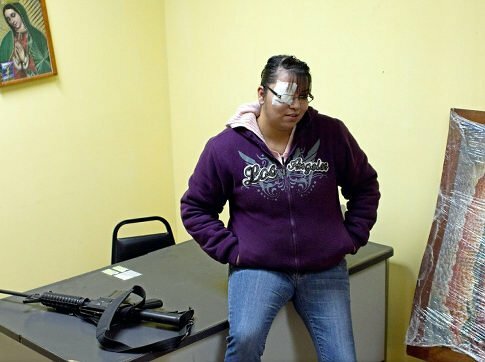 Erika Gandara, 28, was the Mexican village’s entire police force in the farming communities in the valley of Juarez, the El Paso Times reports. A spokesman for the Chihuahua state attorney general’s office told the newspaper on Monday that authorities were aware of the incident involving Gandara, but there was still no official report of the kidnapping. Arturo Sandoval, a spokesman for prosecutors in northern Chihuahua state, said a search has begun for Gandara, who hasn’t been since seen Dec. 23. Sandoval said Tuesday that the search started as a missing-person case. The rural valley, which is across the border from El Paso, Texas, is a busy smuggling corridor and has been plagued with narcotics-related violence. Three severed heads were left in an ice chest in the plaza in Guadalupe, the newspaper reports, with one of the heads belonging to a police commander. Several town council members have also been murdered.